I actually finished reading this book over a month ago, and even though I meant to write a review immediately, I obviously kind of forgot about that. So I apologize in advance, because I’m going to be a little fuzzy on the details. First, background: Dorothy Sayers left this book unfinished, having abandoned it in 1936. 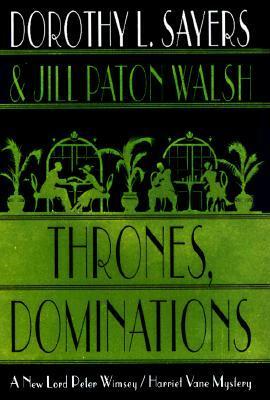 She left some fragments of the novel behind, and Jill Paton Walsh was recruited to finish the book in 1998. It’s not clear how much of the book is Sayers and how much is Walsh, but it feels primarily the latter, and I’m try to articulate why I felt this way. ‘I thought husbands and wives were always placed apart,’ said Harriet. Another wonderful choice made in this novel – Harriet gets her own Bunter! Walsh is clearly just as in love with Peter and his manservant, Bunter, as I am. In this novel, Harriet gets a lady’s maid named Miss Mango, who is recruited into the mystery solving and throws herself into the work with professional gusto, and it is wonderful. I feel like this was Walsh’s idea instead of Sayers’, because giving each of the Wimsey’s a mystery-assisting servant gives the story almost too much symmetry, and feels like something a fan would write, rather than the author. I also thought that naming the character “Miss Mango” wasn’t something Sayers would do, but then I remembered the man named Waffles, so who knows. Either way, Miss Mango is a fantastic addition to the team. That’s about where my love of this book ends, however. The mystery is pretty straightforward, as they usually are in Sayers novels – basically, we have a dead wife, a suspicious husband, and some potential lovers. Plus a faked break-in, so that’s fun! But the solution to the mystery was not what I was expecting, and not in a good way. So the dead wife’s face is really battered, and in most mysteries, wrecking the corpse’s face means that you’re trying to disguise the identity of said corpse. It’s discovered later that the husband has a mistress who, like his wife, has red hair. So I was thinking, okay, maybe the dead body is actually the mistress, and the wife ran off? I figured there had to be a reason that the wife and the mistress looked similar, but there really isn’t – it felt sloppy, and very un-Sayers, so I’m going to blame it on Walsh. Also, since the book takes place in the 1930’s but was (mostly) written in the 1990’s, it unfortunately suffers the curse of bad historic fiction: excessive, distracting foreshadowing. The events of this book take place right around the time Edward VIII was trying to marry Wallis Simpson, so there’s a lot of very obvious “Gee, hope this won’t have any long-reaching consequences for the monarchy!” and it was tiring. The diary entries written by Peter’s mother are the worst source of obnoxious foreshadowing – they’re all “oh, the king would never marry a divorced woman!” and “man, what’s up with Germany lately?” It was distracting and stupid, because it was so clearly written by someone living decades after the original draft, who had the advantage of 20/20 hindsight. It was lazy and cheap, and took me out of the story completely because it was obviously not written by Sayers. Sayers abandoned this story in 1936, but she didn’t abandon Harriet and Peter – she went on to write several short stories that took place after the events of this novel (which means one of the central conflicts of this book – will Harriet and Peter have kids? – has already been resolved by later stories). I dunno, I think it’s a sign that Sayers continued writing about Harriet and Peter, but never went back to try to make this book work. Maybe they should have just left it alone.